The Friedlander Group - "Cruz came out swinging," saying the United States needs "wartime president to defend it." Home » In the News » Quotes, Mentions, Photos » 2016 U.S. Presidential Election » "Cruz came out swinging," saying the United States needs "wartime president to defend it." "Cruz came out swinging," saying the United States needs "wartime president to defend it." "What the hell does that mean?" tweeted Ari Fleischer, former George W. Bush press secretary and now on the RJC board of directors. One member of the RJC board said of Trump's words, "If that's not anti-Semitic I don't know what is." The Anti-Defamation League, however, defended Trump, issuing a statement saying "context is everything. Mr. Trump's presentation was completely supportive of Israel and the Jewish community." Ezra Friedlander, the chasidic CEO of the Friedlander Group, a public affairs organization, said Trump reminded him of "Archie Bunker, or rather Jackie Mason. He didn't speak with anti-Semitic overtones; he was trying to be funny. I was able to realize how he's both appealing when expressing his most raw, unpolished feelings, and also how dangerous it is to see a candidate be so unprepared. Perhaps he burnished his comedic credentials, but didn't earn any points as a serious candidate." When it came to something serious, such as a question about Israel's sovereignty over Jerusalem, he said, "his body language told me he had no idea what the question was about." A few days later, when Trump suggested banning all Muslims from entering the United States, Jewish groups lined up all over again to explain his comments or express their fury and frustration. Of course, money was an issue. RJC board member Sheldon Adelson, the Las Vegas billionaire, contributed more money in the 2012 election than anyone else. The Wall Street Journal recently pointed out, "The RJC board is stocked with some of the GOP's biggest rainmakers, including former ambassadors and a former Republican National Committee chairman," wrote the Journal. "Many of the candidates," including Bush, Christie, Rubio and Cruz, "organized fundraising events around the RJC forum." Phil Rosen, a RJC board member and a lawyer with Weil, Gotshal and Manges, said the Coalition event revealed the emergence of strong, conservative, pro-Israel candidates who had a real chance to win next November. "The stars were clearly Cruz and Rubio; they did fabulous." Rosen is backing Rubio, saying "he's the right person to lead our nation into the future. I say that very carefully." Rosen, also a strong supporter of Likud, explained that the Coalition will not endorse anyone until the convention does. "Then we will gather around and support that candidate beyond all extremes." Until then, Coalition members can support and contribute to whomever they please, though not all of the 14 candidates have support in the RJC. The race in the RJC, said Rosen, is down to "Rubio, Cruz, Bush and maybe Christie. There may be a straggler here or there supporting Carly [Fiorina]. You do have people supporting Lindsey [Graham], knowing full well that the possibility of him winning is getting less every day. You kind of wonder whether he's trying out for secretary of state." Jeff Wiesenfeld, a principal with the investment firm AllianceBernstein, a former aide to Gov. 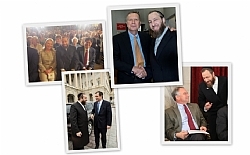 George Pataki and a leading activist on the Jewish right, said, "In a perfect world, beyond any question, with the situation that we're facing today... the best qualified candidate is Lindsey Graham. But Graham, I don't have to tell you, has not caught fire. ... People seem to be putting money into Rubio right now. It seems to be moving in his direction." At the same time, said Wiesenfeld, "There's a lot of emotional appeal that I have, and others have for Cruz, but there's a perception that he wouldn't be able to win." He said, "Cruz doesn't have, let's be honest, the same likeability factor that Reagan had," just as Jeb Bush lacks his brother's charm. Friedlander liked the way "Cruz came out swinging," saying the United States needs "a wartime president to defend it." Cruz said colleges that endorse BDS should lose their federal funding, as "anti-Semitism hides behind the label of anti-Israel." Cruz said our approach to jihadists should be very simple. "We win. They lose. ... If you wage jihad against the United States of America, you will sign your death warrant."